Douglas Preston ’78 takes on the Goliath of books. This past year Amazon spent many months in testy negotiations with Hachette, the fourth-largest book publisher in the U.S. When no agreement had been reached by May, Amazon began delaying shipment of Hachette books, shutting down pre-orders, and even removing the publisher’s titles from its all-important recommendation algorithms. Such gestures aren’t trivial—when the entity responsible for selling 40 percent of America’s printed books makes yours difficult to buy, sales drop. Sitting here on the deck of his spacious summer house overlooking Maine’s pristine Muscongus Bay, thriller writer Douglas Preston ’78 clearly isn’t worried for his own livelihood. He’s published more than a dozen best-sellers and cultivated a devout following that will find him with or without Amazon. 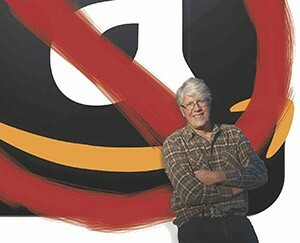 It wasn’t a completely united front—a vocal contingent of self-published authors posted lengthy screeds online calling him a “one-percenter,” a “pinhead” and worse, while Amazon reps dismissed him in the press as “entitled” and “an opportunist.” When Amazon found out that he planned to publish his letter as a full-page ad in The New York Times, the company’s head of e-books tracked down his phone number and called to issue veiled threats and try to stop him. Preston shrugs when he reflects on how the situation escalated and how he, improbably, became the face behind a movement that he never set out to lead. The Hachette dispute is far from Amazon’s first: in 2010 it deleted the “buy” option for all MacMillan books, which quickly forced the publisher to cave in during negotiations. The company often paints publishing houses as middlemen and gatekeepers—relics from another era whose skills at distribution and publicity have been rendered moot by instant downloads and viral word-of-mouth. Many self-published authors agree. Sci-fi writer Hugh Howey has collected more than 8,000 signatures for a Change.org petition arguing that companies like Hachette are “resisting technology” rather than adapting to the changing times. Preston, naturally, begs to differ. He sees publishers as vital curators, editors and investors, and believes that the biggest challenge for Authors United is, ironically enough, telling the right stories. Here’s his: it’s 1978, and he’s a fresh-faced college grad creating communications content for the American Museum of Natural History. The job pays peanuts but lets him explore all of the museum’s hidden treasures, from majestic butterfly exhibits to a hair-raising “dinosaur graveyard” in the basement. A few years into the gig, he gives a tour to an editor named Lincoln Child, who suggests that he pull his anecdotes into a book. While novels can often be cobbled together on nights and weekends, Preston’s journalistic writing would require some heavy daytime reporting. As a first-time author, Preston isn’t in a position to drop everything to write, but his publisher St. Martin’s Press gives him an advance of $7,200 that lets him take six months off from his job. “Without that cash, there’d be no first book and I might not even be doing this for a living right now,” he says. The experience made Preston recognize the importance of publishers as venture capitalists for ideas—a tradition that, in a sense, extends back to the Renaissance, when royal families like the Medicis funded artwork by Michelangelo and Sandro Botticelli. As with most business disputes, Amazon and Hachette’s boils down to dollar signs. Their main disagreement has revolved around e-books, which now make up almost a third of the market. Currently 30 percent of each e-book’s revenues go to Amazon, and 70 percent go to Hachette, which then carves out a cut for the author (usually 10 to 15 percent). While nobody knows exactly what was happening behind closed doors during negotiations, Amazon was reportedly pressing for 50 percent of revenues. What’s also at stake are e-book prices themselves. Amazon has famously been selling many e-books at a loss, and says that prices above $9.99 hurt overall sales. Hachette, meanwhile, has been reluctant to set a precedent for lower prices that might cannibalize hardcover sales. Preston says he has no particular problems with $10 e-books, but at the same time is flummoxed by the animosity leveled at authors whose books are being sold for a few dollars more. Amazon has likened e-books to paperbacks, another technological advance that lowered literature’s costs but also allowed for its increased availability. Many authors would counter that the Amazon-driven trend toward lower and lower e-book prices threatens the long-term viability of the entire profession. It’s not just first-time authors who’ve felt the pinch, which is why many authors were wary about signing a letter like Preston’s that would pit them against such a massive retail juggernaut. Novelist Lucy Ferriss ’75 was gung-ho about Authors United last summer, but as the publication date of her next book approached, she started reflecting on the wide reach of Amazon, which owns both the review site Goodreads and Audible (the seller of the majority of the world’s audiobooks). Despite her reservations, she’s stayed on-board—in no small part because of Preston’s dedication. She recalls that when he and his brother Richard ’76 (a fellow writer) joined Pomona’s literary magazine Passwords, it only took a matter of weeks for her team of editors to voluntarily hand over control. Since the initial letter, Authors United tried to reach out directly to members of the Amazon Board, with no luck. Preston was also approached by a team of prestigious pro bono lawyers who will be submitting a formal brief for the Department of Justice that outlines Amazon’s antitrust violations. He hopes it will encourage, if not an actual lawsuit, then at least more transparency on the part of retailers and publishers’ business dealings. When I met with Preston on a crisp autumn morning in October, he sounded frustrated and a tad overwhelmed. He was promoting the publication of his third novel of 2014, gearing up for a book fair in United Arab Emirates, working on the next installment in his popular “Pendergast” series, and fielding phone calls from journalists about the ongoing publishing feud. “Truth be told, I’m sick and tired of the situation, and would love to get rid of Authors United and go back to writing books,” he told me then. Preston views the resolution as just the end of one battle in a larger war for writers, publishers and retailers. Despite the tedious and thankless nature of his role, he says he takes comfort in the fact that his efforts have put a spotlight on the changing landscape of his industry—and the tricky economics that come with being an author in the digital age.